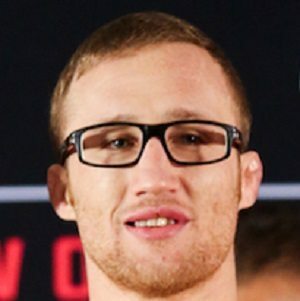 Justin Ray “The Highlight” Gaethje, born on November 14, 1988, is an American wrestler and mixed martial artist competing in the UFC lightweight division. 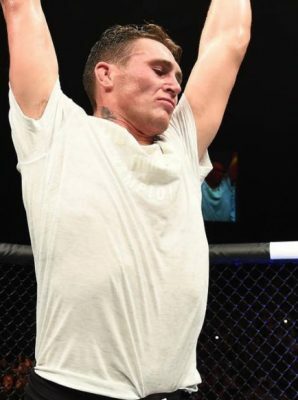 He is a former lightweight champion of WSOF and at time of writing he is undefeated. Gaethje was born in Safford, Arizona to parents of Mexican and German descent. He started wrestling at 4 years old and became a two-time Arizona state champion representing Safford High School. He also became a NCAA Division 1 all-american while he was attending the University of Northern Colorado, which he was the first, and so far only Northern Colorado athlete to attain this honor. He has a bachelor’s degree in human services and intends to work with at-risk youth in the future. Justin Gaethje started training MMA during his time at the University of Northern Colorado. He made his amateur MMA debut in 2008 and won by knockout after 27 seconds. He amassed a 7-0 record as an amateur, winning all but one by stoppage (4 TKO, 2 Sub). He made his pro MMA debut in 2011 against Kevin Croom and won by knockout due to a slam in the first round. He had six more fights going 6-0 with 5 wins via stoppage, before he signed with the World Series of Fighting. Justin Gaethje made his WSOF debut against highly touted Brazilian lightweight Gesias “JZ” Cavalcante. Gaethje defeated Cavalcante by doctors stoppage after only 2:27 of the first round. Gaethje kept on winning and defeated Brian Cobb via TKO due to leg kicks at WSOF 3. At WSOF 6 he defeated brother of UFC lightweight great Joe Lauzon, Dan Lauzon via uppercut in the 2nd round. Justin Gaethje headlined his first WSOF card against Richard Patishnock for the inaugural WSOF lightweight strap. He defeated Patishnock by TKO in the first round. He then defended his belt against Nick Newell by TKO in the 2nd round. Gaethje was supposed to defend his belt against former training partner Melvin Guillard at WSOF 15, but Guillard missed weight making it a non-title affair. Gaethje won by split decision. In his next fight he fought veteran Luis Palomino at WSOF 19. Gaethje defeated Palomino in the 3rd round by TKO. The LA Times named the fight “Best fight of 2015”. They rematched at WSOF 23 with Gaethje winning by finish in the 2nd round. He defended his belt twice more before signing with the UFC. Justin Gaethje made his UFC debut against veteran lightweight Michael “The Menace” Johnson on July 7th at TUF: Redemtion Finale. Gaethje got rocked in the first round and the fight was pretty back and forth until the end of round 2 when Gaethje connected with a series of punches and knees. Gaethje was awarded double bonuses, Performance of the Night and Fight of the Night. Gaethje then faced former lightweight champion Eddie “The Underground King” Alvarez at UFC 218 in Detroit. After a brutal war Gaethje was knocked out by a knee in the last round. At time of writing UFC doesn’t have a fight scheduled for Justin Gaethje.